Construction HTML Template MegaBuilder is a professional corporate HTML template for construction, interior design, industrial design, engineering, architecture design, building renovation, renovate, factory or manufacturing companies, etc. MegaBuilder helps you create an awesome looking & highly functional website with a strong impression of professional, trust and innovation just like your company. 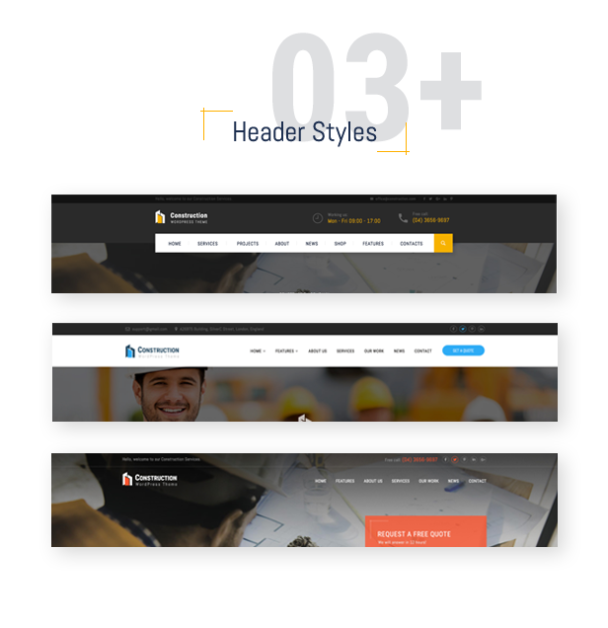 This construction template is multipurpose for all industries so even if you are working in some other fields like landscaping, plumber, mechanic, electrician, firefighter, repairer, carpenter, painter, …, it would still help you create a powerful, beautiful and modern website for your business in just a few minutes. Unlike other Multi-Purpose, Multi-Niche template which are used for many niches but have no special focus, MegaBuilder is the multipurpose HTML template made only for construction, building interior design, architecture, and industrial sector. Therefore, it has all the needed elements for a construction engineering business to prosper. The theme’s layouts and features are arranged logically to make sure it would win your client’s heart and win more profitable deals, more contracts for you.